It`s two... two... two tricks in one. You can perform it as a card revelation or a packet trick. Performed as a packet trick with the theme of a vision test, a four of a kind is shown. The spectator is asked which card was face down, they say, none. The cards are shown and the Heart is face down. One at a time the remaining cards turn face down (showing a red back). Then all the cards are face up again. To test their color vision, they are asked to name the back color of the cards (red). All the backs are seen to have blue backs. To test their vision retention, one card is pocketed, but four cards are shown. The cards are turned face down, and the spectator is asked to read the top line (an eye chart is printed in bold black letters on the backs of all four cards which are examinable!). As a card revelation, the spectator selects a card (Force). After several failed tries the magician asks for the name of the selected card and to make sure the card was seen correctly, an eye exam is given. 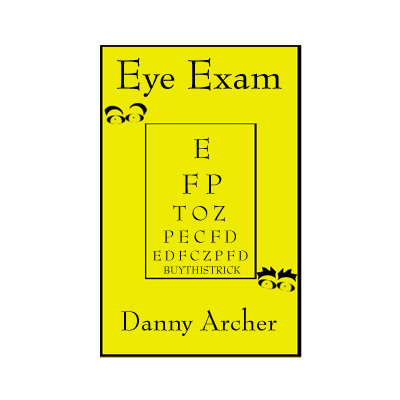 The trick then finishes as before and the name of the selected card is seen printed on the eye chart! Eye Exam is very easy to do (if you can hold two card together as one, that`s all you need to do!). Also includes a page of additional tips and hints called Eye Exam Extras that give hints and tips, and a finish where the cards are examinable (thanks to a Paul Harris suggestion). It also gives you neat ideas like how to produce a rubber eyeball at the finish.